Are we doomed? This report is not optimistic — instead it quite starkly spells out the challenge that faces humans, as a total planetary population, if we are to have our species survive for another 100 years. The language of the report is quite dry, as we expect from scientists. But the report, from the International Panel on Climate Change (IPCC), is really quite urgent. If the planet — meaning you and me — does not make dramatic progress in controlling carbon air pollution now, any child born now will face dramatic problems from climate warming. Who will respond to the call to arms? Who will read this report? I’m providing links to the report here, and the complete press release. Read it here (or at the UN site linked) to get the facts, and to see just how much distortion gets introduced by anti-Earth, anti-science propagandists. Incheon, Republic of Korea, October 8– Limiting global warming to 1.5°C would require rapid, far-reaching and unprecedented changes in all aspects of society, the IPCC said in a new assessment. With clear benefits to people and natural ecosystems, limiting global warming to 1.5°C compared to 2°C could go hand in hand with ensuring a more sustainable and equitable society, the Intergovernmental Panel on Climate Change (IPCC) said on Monday. The Special Report on Global Warming of 1.5°C was approved by the IPCC on Saturday in Incheon, Republic of Korea. It will be a key scientific input into the Katowice Climate Change Conference in Poland in December, when governments review the Paris Agreement to tackle climate change. “With more than 6,000 scientific references cited and the dedicated contribution of thousands of expert and government reviewers worldwide, this important report testifies to the breadth and policy relevance of the IPCC,” said Hoesung Lee, Chair of the IPCC. Ninety-one authors and review editors from 40 countries prepared the IPCC report in response to an invitation from the United Nations Framework Convention on Climate Change (UNFCCC) when it adopted the Paris Agreement in 2015. The report’s full name is Global Warming of 1.5°C, an IPCC special report on the impacts of global warming of 1.5°C above pre-industrial levels and related global greenhouse gas emission pathways, in the context of strengthening the global response to the threat of climate change, sustainable development, and efforts to eradicate poverty. “One of the key messages that comes out very strongly from this report is that we are already seeing the consequences of 1°C of global warming through more extreme weather, rising sea levels and diminishing Arctic sea ice, among other changes,” said Panmao Zhai, Co-Chair of IPCC Working Group I. The report highlights a number of climate change impacts that could be avoided by limiting global warming to 1.5°C compared to 2°C, or more. For instance, by 2100, global sea level rise would be 10 cm lower with global warming of 1.5°C compared with 2°C. The likelihood of an Arctic Ocean free of sea ice in summer would be once per century with global warming of 1.5°C, compared with at least once per decade with 2°C. Coral reefs would decline by 70-90 percent with global warming of 1.5°C, whereas virtually all (> 99 percent) would be lost with 2°C. “Every extra bit of warming matters, especially since warming of 1.5°C or higher increases the risk associated with long-lasting or irreversible changes, such as the loss of some ecosystems,” said Hans-Otto Pörtner, Co-Chair of IPCC Working Group II. Limiting global warming would also give people and ecosystems more room to adapt and remain below relevant risk thresholds, added Pörtner. The report also examines pathways available to limit warming to 1.5°C, what it would take to achieve them and what the consequences could be. “The good news is that some of the kinds of actions that would be needed to limit global warming to 1.5°C are already underway around the world, but they would need to accelerate,” said Valerie Masson-Delmotte, Co-Chair of Working Group I. The report finds that limiting global warming to 1.5°C would require “rapid and far-reaching” transitions in land, energy, industry, buildings, transport, and cities. Global net human-caused emissions of carbon dioxide (CO2) would need to fall by about 45 percent from 2010 levels by 2030, reaching ‘net zero’ around 2050. This means that any remaining emissions would need to be balanced by removing CO2 from the air. “Limiting warming to 1.5°C is possible within the laws of chemistry and physics but doing so would require unprecedented changes,” said Jim Skea, Co-Chair of IPCC Working Group III. Allowing the global temperature to temporarily exceed or ‘overshoot’ 1.5°C would mean a greater reliance on techniques that remove CO2 from the air to return global temperature to below 1.5°C by 2100. The effectiveness of such techniques are unproven at large scale and some may carry significant risks for sustainable development, the report notes. “Limiting global warming to 1.5°C compared with 2°C would reduce challenging impacts on ecosystems, human health and well-being, making it easier to achieve the United Nations Sustainable Development Goals,” said Priyardarshi Shukla, Co-Chair of IPCC Working Group III. The decisions we make today are critical in ensuring a safe and sustainable world for everyone, both now and in the future, said Debra Roberts, Co-Chair of IPCC Working Group II. “This report gives policymakers and practitioners the information they need to make decisions that tackle climate change while considering local context and people’s needs. The next few years are probably the most important in our history,” she said. The IPCC is the leading world body for assessing the science related to climate change, its impacts and potential future risks, and possible response options. The report was prepared under the scientific leadership of all three IPCC working groups. Working Group I assesses the physical science basis of climate change; Working Group II addresses impacts, adaptation and vulnerability; and Working Group III deals with the mitigation of climate change. As part of the decision to adopt the Paris Agreement, the IPCC was invited to produce, in 2018, a Special Report on global warming of 1.5°C above pre-industrial levels and related global greenhouse gas emission pathways. The IPCC accepted the invitation, adding that the Special Report would look at these issues in the context of strengthening the global response to the threat of climate change, sustainable development, and efforts to eradicate poverty. Global Warming of 1.5°C is the first in a series of Special Reports to be produced in the IPCC’s Sixth Assessment Cycle. Next year the IPCC will release the Special Report on the Ocean and Cryosphere in a Changing Climate, and Climate Change and Land, which looks at how climate change affects land use. The Summary for Policymakers (SPM) presents the key findings of the Special Report, based on the assessment of the available scientific, technical and socio-economic literature relevant to global warming of 1.5°C. 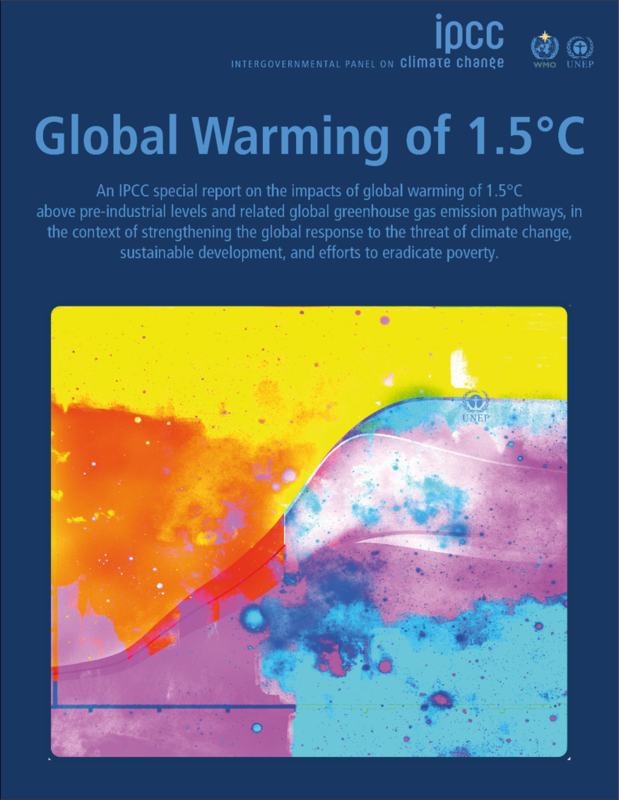 The Summary for Policymakers of the Special Report on Global Warming of 1.5°C (SR15) is available at https://www.ipcc.ch/report/sr15 or www.ipcc.ch. Notes for editors The Special Report on Global Warming of 1.5 °C, known as SR15, is being prepared in response to an invitation from the 21st Conference of the Parties (COP21) to the United Nations Framework Convention on Climate Change in December 2015, when they reached the Paris Agreement, and will inform the Talanoa Dialogue at the 24th Conference of the Parties (COP24). The Talanoa Dialogue will take stock of the collective efforts of Parties in relation to progress towards the long-term goal of the Paris Agreement, and to inform the preparation of nationally determined contributions. Details of the report, including the approved outline, can be found on the report page. The report was prepared under the joint scientific leadership of all three IPCC Working Groups, with support from the Working Group I Technical Support Unit. The Intergovernmental Panel on Climate Change (IPCC) is the UN body for assessing the science related to climate change. It was established by the United Nations Environment Programme (UN Environment) and the World Meteorological Organization (WMO) in 1988 to provide policymakers with regular scientific assessments concerning climate change, its implications and potential future risks, as well as to put forward adaptation and mitigation strategies. It has 195 member states. IPCC assessments provide governments, at all levels, with scientific information that they can use to develop climate policies. IPCC assessments are a key input into the international negotiations to tackle climate change. IPCC reports are drafted and reviewed in several stages, thus guaranteeing objectivity and transparency. The IPCC assesses the thousands of scientific papers published each year to tell policymakers what we know and don’t know about the risks related to climate change. The IPCC identifies where there is agreement in the scientific community, where there are differences of opinion, and where further research is needed. It does not conduct its own research. To produce its reports, the IPCC mobilizes hundreds of scientists. These scientists and officials are drawn from diverse backgrounds. Only a dozen permanent staff work in the IPCC’s Secretariat. The IPCC has three working groups: Working Group I, dealing with the physical science basis of climate change; Working Group II, dealing with impacts, adaptation and vulnerability; and Working Group III, dealing with the mitigation of climate change. It also has a Task Force on National Greenhouse Gas Inventories that develops methodologies for measuring emissions and removals. IPCC Assessment Reports consist of contributions from each of the three working groups and a Synthesis Report. Special Reports undertake an assessment of cross-disciplinary issues that span more than one working group and are shorter and more focused than the main assessments. At its 41st Session in February 2015, the IPCC decided to produce a Sixth Assessment Report (AR6). At its 42nd Session in October 2015 it elected a new Bureau that would oversee the work on this report and Special Reports to be produced in the assessment cycle. At its 43rd Session in April 2016, it decided to produce three Special Reports, a Methodology Report and AR6. The Methodology Report to refine the 2006 IPCC Guidelines for National Greenhouse Gas Inventories will be delivered in 2019. Besides Global Warming of 1.5°C, the IPCC will finalize two further special reports in 2019: the Special Report on the Ocean and Cryosphere in a Chanhttps://twitter.com/IPCC_CH/status/1049127236564082689ging Climate and Climate Change and Land: an IPCC special report on climate change, desertification, land degradation, sustainable land management, food security, and greenhouse gas fluxes in terrestrial ecosystems. The AR6 Synthesis Report will be finalized in the first half of 2022, following the three working group contributions to AR6 in 2021. Discuss away, comments are open. From Climate Central: Octobers are warming across the U.S. with the increasing accumulation of greenhouse gases in the atmosphere. Since 1970, October temperatures have risen about 2°F. Warming throughout the fall is even stronger in some parts of the country, with the Northeast and the West warming the most. This warming can delay the start of some of the traditional cold season activities in cooler and mountainous climates, such as skiing. The warming trend also means first freezes occur later in the year, which can allow more insects to survive later into the year and make for a longer fall allergy season. 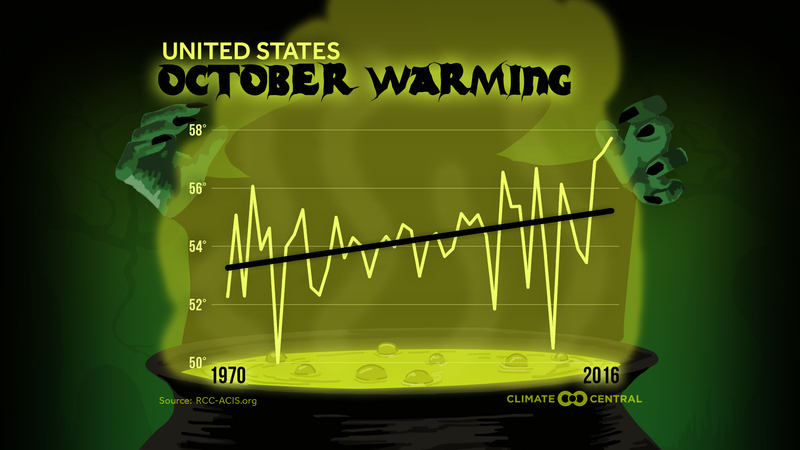 Since 1970, Octobers are 2 degrees warmer? No big deal? Reduce the number of freezing days, allowing pine bark beetles in Colorado to escape death by freezing, and thereby kill more pine trees, faster. Change October precipitation from snow, to rain. Rain instead of snow may cause regional flooding due to the rapid water dump; it may reduce snowpacks that provide water through the warmer months, effectively adding to drought threat. Keep some prairie flowers alive longer, delaying migration of butterflies triggered by reduced food supply; ultimately this could cause butterflies and other migrating beneficial insects to migrate too late in the year. No big deal, unless you live on Earth. “What did you do when you learned CO2 was hurting the planet, Grandfather?” our grandchildren will well ask. Got an answer? Shake of the old scrub brush to Climate Central’s Twittering, with a clever .gif. Gee, while we’re exploring Hans Rosling‘s and Gapminder’s videos at Vimeo, let’s take a look at the animated chart showing CO² emissions since 1820. Anything we can learn there? 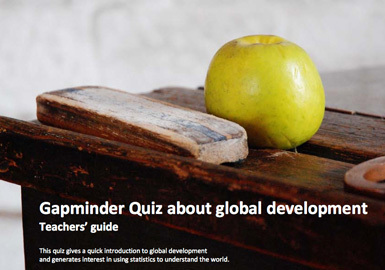 Teacher resources: Gapminder quiz on global development, an introductioin to the issue. 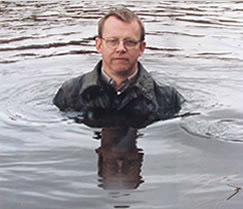 Hans Rosling says “Don’t Panic!” Defusing the population bomb? Yes, that famous Rosling guy with the bouncing bubble, animated charts from TEDS. TEDS star Hans Rosling, not in over his head. The world might not be as bad as you might believe! Don’t Panic – is a one-hour long documentary produced by Wingspan Productions and broadcasted on BBC on the 7th of November 2013. The visualizations are based on original graphics and stories by Gapminder and the underlaying data-sources are listed here. Hans’s — “All time favorite graph”, is an animating bubble chart which you can interact with online here and download offline here. Hans presents some results from our UK Ignorance Survey described here. Director & Producer; Dan Hillman, Executive Producer: Archie Baron. ©Wingspan Productions for BBC, 2013. A DVD version of this film is available to order from Wingspan Productions. Alas, we can’t embed the film. You must view the video — for free — at the Gapminder site, here. What year is this? 2013? Shouldn’t the Sputnik Revolution in science education have obviated the need for this video, like 30 years ago? This is a press release from NASA, presented here for the record, text unedited except for formatting where necessary, and the deletion of the press office phone numbers (I hope that’s not necessary, but earnest information seekers have links to get the information they seek). Images are inserted from other, related NASA sites. WASHINGTON — NASA scientists say 2012 was the ninth warmest of any year since 1880, continuing a long-term trend of rising global temperatures. With the exception of 1998, the nine warmest years in the 132-year record all have occurred since 2000, with 2010 and 2005 ranking as the hottest years on record. NASA’s Goddard Institute for Space Studies (GISS) in New York, which monitors global surface temperatures on an ongoing basis, released an updated analysis Tuesday that compares temperatures around the globe in 2012 to the average global temperature from the mid-20th century. The comparison shows how Earth continues to experience warmer temperatures than several decades ago. [Caption to video] NASA’s analysis of Earth’s surface temperature found that 2012 ranked as the ninth-warmest year since 1880. NASA scientists at the Goddard Institute for Space Studies (GISS) compare the average global temperature each year to the average from 1951 to 1980. This 30-year period provides a baseline from which to measure the warming Earth has experienced due to increasing atmospheric levels of heat-trapping greenhouse gases. While 2012 was the ninth-warmest year on record, all 10 of the warmest years in the GISS analysis have occurred since 1998, continuing a trend of temperatures well above the mid-20th century average. The record dates back to 1880 because that is when there were enough meteorological stations around the world to provide global temperature data. The average temperature in 2012 was about 58.3 degrees Fahrenheit (14.6 Celsius), which is 1.0 F (0.6 C) warmer than the mid-20th century baseline. The average global temperature has risen about 1.4 degrees F (0.8 C) since 1880, according to the new analysis. Scientists emphasize that weather patterns always will cause fluctuations in average temperature from year to year, but the continued increase in greenhouse gas levels in Earth’s atmosphere assures a long-term rise in global temperatures. Each successive year will not necessarily be warmer than the year before, but on the current course of greenhouse gas increases, scientists expect each successive decade to be warmer than the previous decade. Carbon dioxide is a greenhouse gas that traps heat and largely controls Earth’s climate. It occurs naturally and also is emitted by the burning of fossil fuels for energy. Driven by increasing man-made emissions, the level of carbon dioxide in Earth’s atmosphere has been rising consistently for decades. The carbon dioxide level in the atmosphere was about 285 parts per million in 1880, the first year in the GISS temperature record. By 1960, the atmospheric carbon dioxide concentration, measured at NOAA’s Mauna Loa Observatory, was about 315 parts per million. Today, that measurement exceeds 390 parts per million. While the globe experienced relatively warm temperatures in 2012, the continental U.S. endured its warmest year on record by far, according to NOAA, the official keeper of U.S. weather records. The temperature analysis produced at GISS is compiled from weather data from more than 1,000 meteorological stations around the world, satellite observations of sea-surface temperature, and Antarctic research station measurements. A publicly available computer program is used to calculate the difference between surface temperature in a given month and the average temperature for the same place during 1951 to 1980. This three-decade period functions as a baseline for the analysis. The last year that experienced cooler temperatures than the 1951 to 1980 average was 1976. 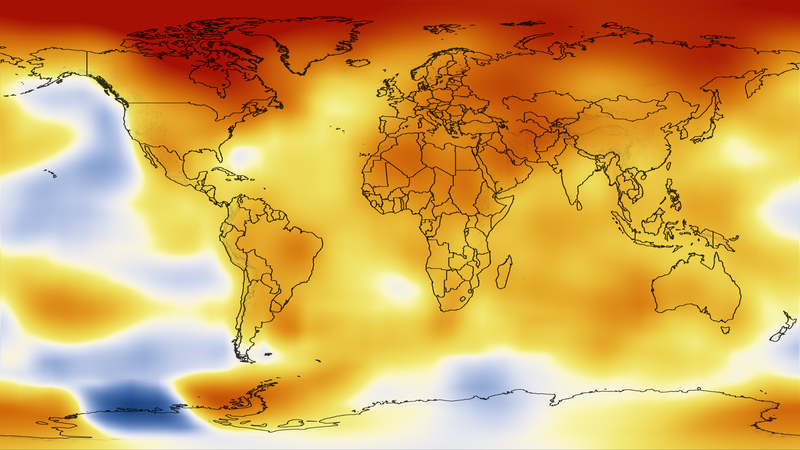 The GISS temperature record is one of several global temperature analyses, along with those produced by the Met Office Hadley Centre in the United Kingdom and the National Oceanic and Atmospheric Administration’s National Climatic Data Center in Asheville, N.C. These three primary records use slightly different methods, but overall, their trends show close agreement. The past decade has been the hottest ever recorded since global temperature records began 150 years ago. This video discusses the impacts of the sun’s energy, Earth’s reflectance and greenhouse gasses on global warming. Vital Signs of the Planet: Global Climate Change and Global Warming. 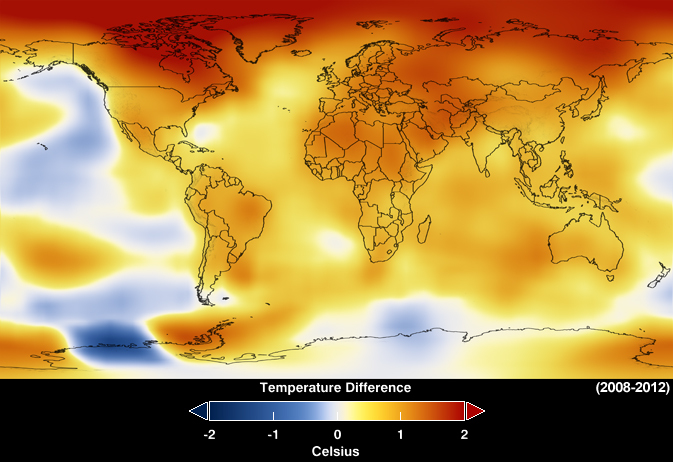 Current news and data streams about global warming and climate change from NASA. More NASA climate films, here, at Climate Reel. You are currently browsing the archives for the Carbon Dioxide category.